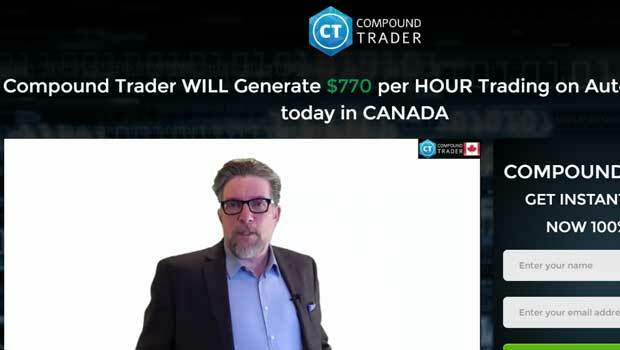 Compound trader is another binary options software promising $770 per hour on autopilot being given away for free. The developer of the system is Albert Henderson, he has no prior reputation in the binary options market and tells us that his current members are hurting $12,000 a day. Today I will be taking a closer look at Albert Henderson and this binary options offer so that I can provide a thorough and unbiased review. Reviewing systems like the compound trader has been my life for the past 2 years and I will admit to you it can be extremely frustrating. Developers like Albert Henderson give the binary options market a bad name. People in positions of authority, like Albert is in this case should be more respectful of binary options traders. Albert tells us that members of his software by making $12,000 a day. These numbers in binary options are absolutely outrageous. It’s clear to me immediately that Albert is going to say anything to acquire new clients, even if he has to lie. I’ll tell you right now, there isn’t a single software in the world that’s going to automatically make you $12,000 day. Especially in binary options with trades are easy to operate but not easy to win. The compound trader promises to win 98% of all trades. This is another number that we can’t trust because it’s unrealistic. Not only is it unrealistic, but it’s also unproven. The results table on the compound website only shows us 10 trades at a time so we can’t go back and look at historical evidence. Thus, there is no way to verify this 98% winning ratio is actually true. Also, if you take a close look at the results table on the website it is clearly a script generating trades. I don’t believe that this results table is real are connected to any binary options account because it doesn’t show actual prices or open times. I believe these 2 elements are left out so that we cannot verify the trades and prove that they are real or not. The testimonials can’t be trusted, and neither can Albert Henderson. Even as the nerve to offer a $5000 bonus but I tried to get this send it doesn’t exist. It’s just another lie to try and get you in the door. I don’t see how anyone could believe that the compound trader is anything more than a get rich quick scheme. The website is littered with outlandish promises and guarantees that won’t be filled. Albert Henderson promises and 98% in the money ratio but I believe this binary options software has a 98% chance of blowing your account. Be careful who you read and trust in the binary options market because not everybody has your back like we do it binary today. If you truly want to be successful in the binary options market I suggest you check out the top rated binary options software as voted on by the binary today readers. Please let me know what you think about my review and this new software by leaving a comment below the article now.